The Hamilton Beach TrueAir Compact Pet Air Purifier is inexpensive but very limited. The device is adequate for the reduction of light allergens and mild pet-related smells, and is designed for use in small bedrooms only. The True Air falters when it comes to more serious purification duties; this device isn’t built to handle strong odors or allergens, and is ineffective in medium or large rooms. The Hamilton Beach TrueAir Compact Pet Air Purifier is the most inexpensive air purifier we’ve reviewed so far — and certainly one of the cheapest HEPA air purifiers on the market. As you’ll see, this device has its uses – but don’t expect a whole lot, because you get what you pay for. And what you pay for, in this case, is an air purifier that is situationally adequate but, more often than not, very limited. Cost is this purifier’s biggest selling point. 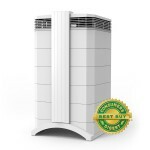 At a tick over $50, the TrueAir is one of the cheapest air purifiers on the market. In fact, this is a really inexpensive unit in more ways than one; beyond the sticker price, the long-term costs (energy usage; filter replacement) are also extremely low. The product picture might be a little deceiving, but this is a very small device; it’s dimensions are 10.8 x 8.1 x 16.4 inches and it weighs 6 pounds – in other words, this is the type of purifier you’ll be putting on the corner of your desk. Since the device is small, it doesn’t use all that much energy – you can run it all day and you probably won’t see a spike in your electric bill. The TrueAir has low maintenance costs, too; the pre-filter is permanent, so you shouldn’t ever have to replace it. The HEPA filter is also permanent – you’ll be able to vacuum the filter to keep it in pretty good shape – which is a major dollar-saver, given that some people spend $100’s of dollars per year on HEPA replacement filters alone. The carbon filters – there are two – are not permanent, and you’ll have to replace those every three months. It costs $10 for a pack of three, or $5 for one. You are best served spending $20 on two packs of three; that way, you’ll have enough filters for the next 9-12 months. As the name implies, this purifier focuses primarily on allergens and allergy-related air issues. 3) A HEPA filter, designed to capture smaller particles down to 0.3 microns in size. According to the manufacturer, this device covers areas up to 140 square feet – so, a room about 12 ft. x 12ft. 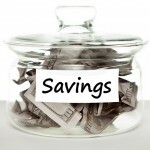 As we mention in a lot of our air purifier reviews, the manufacturer tends to estimate on the high side. In this case, I think that number is a little generous and should be skewed lower; the TrueAir is really designed to perform best in small bedrooms (90 – 120 square feet; or about a 10 ft. x 10ft. room). 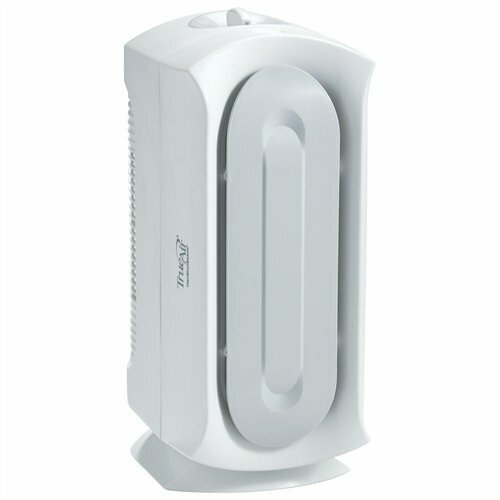 In small bedrooms, the device performs about as well as you’d expect from a budget-buy purifier. It adequately reduces dust levels, and you’ll likely notice a difference in the amount of pet hair on your floor – although the TrueAir certainly leaves some behind (the TrueAir just isn’t strong enough to get everything, nor is the pre-filter high-grade enough). When all is said and done, the TrueAir is an adequate device for people looking for situational purification. Then, the TrueAir is an adequate device for the job. However, this unit is NOT adequate for people with serious purification needs; if you are planning on using this device in medium-large rooms or looking to solve real allergy issues, turn around and run away. Limited, But An Adequate Budget-Buy. The Hamilton Beach TrueAir Compact Pet Air Purifier is inexpensive but very limited. The device is adequate for the reduction of light allergens and mild pet-related smells, and is designed for small bedrooms only. The True Air falters when it comes to more serious purification duties; this device isn’t built to handle strong odors or allergens, and is ineffective in medium or large rooms.